Domenico Ghirlandaio, Portrait of an Old Man and a Boy, ca. 1490; tempera on wood, 24 3/4 x 18 1/4 in. When we look at a portrait painted hundreds of years ago, do we enter into the life of the person portrayed? For me, it is less the understanding of a particular life, than the human feelings of tenderness, beauty, vulnerability, thoughtfulness, or strength, that come when looking at portraits; my heart yearns toward them. I sense these qualities more intensely in the direct, simple clarity of form in Quattrocento painting and sculpture. 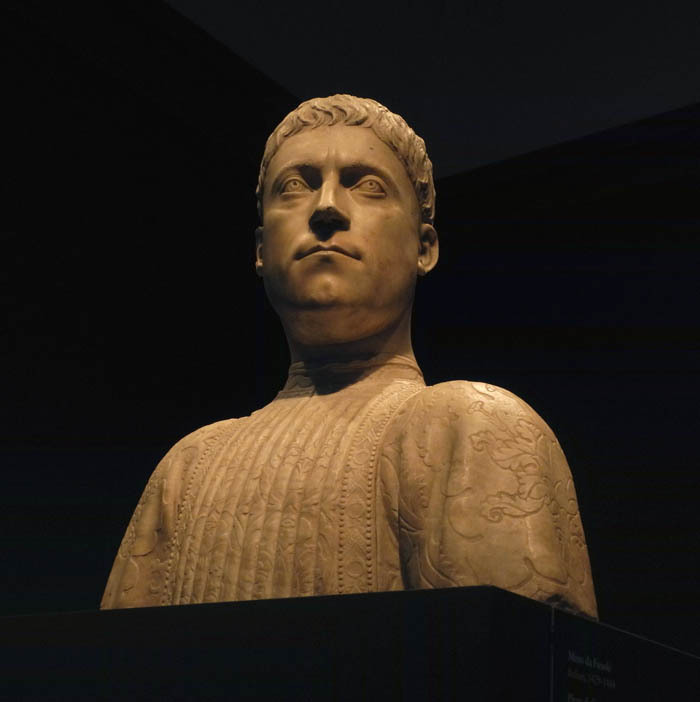 How lucky I was to be able to see a great collection of this work in the exhibition currently at the Metropolitan Museum of Art: The Renaissance Portrait from Donatello to Bellini. I'm beginning this post with the Ghirlandaio double portrait because it's one of the most touching paintings I have ever seen. 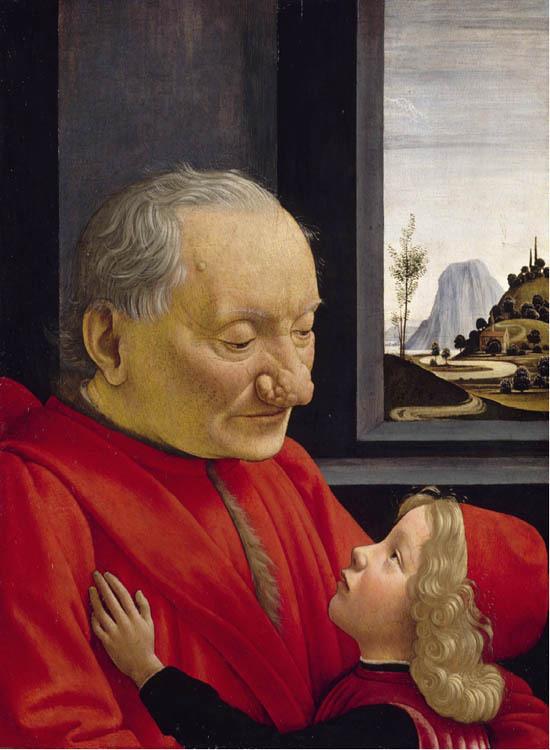 An old man, with wisps of gray hair, a wart, and a diseased nose, looks down gently at his grandson; his soft expression is met with serious adoration from the small boy, whose hand rests lightly on his grandfather's chest as he is encircled by the old man's arm. As with most of these portraits, the subjects are the elite, as we see from the fur escaping from the old man's collar and the elegance of the red clothing. Out the window is a perfect little landscape, a road winding up a rounded hill, a sheer mountain in the distance. The touch of the artist is sure and precise. Florentine Artist (Piero Uccello? ), Profile of a Man; ca. 1430-40; tempera on wood, 16 3/4 x 12 3/4 in. 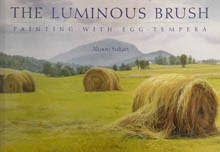 Precision is a characteristic of tempera painting, which made it very well suited to the sensibility of the time (or did the sensibility demand the technique?). In this portrait, a magnificent headdress sits atop a dignified and simple profile. The form of the face is lightly indicated, but full of calm dignity. 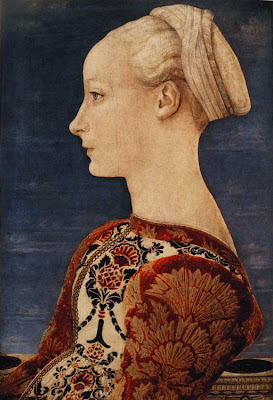 Fra Filippo Lippi, Portrait of a Lady, ca. 1445; tempera on wood, 19 1/2 x 13 in. There were many profiles in this show; it must be that the crisp differentiation of the curving lines of the head with the background were very appealing. In this painting, those lines flow from a pearl-bounded head scarf and swoop down a wide forehead to the nose and mouth. A rounded chin is delicately shadowed; all is highlighted in front of a blue sky. The pale color harmonies seem close to those of fresco. 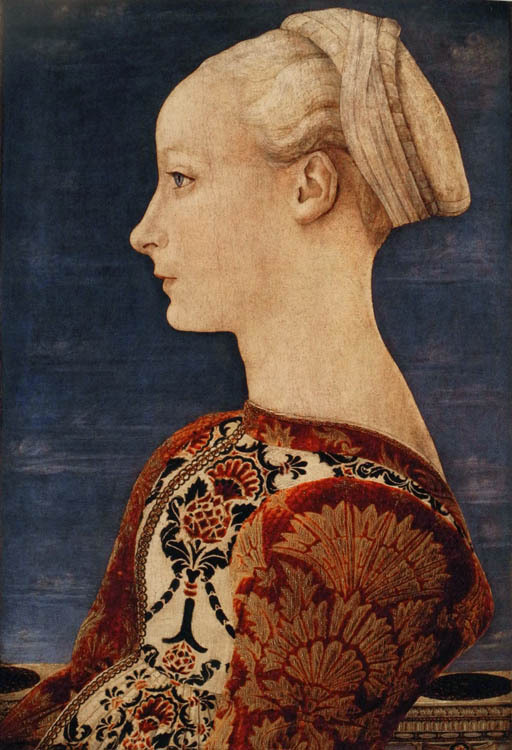 Antonio and Piero del Pollaiuolo, Portrait of a Lady, ca. 1460-65; oil and tempera on wood, 20 5.8 x 14 3/8 in. This portrait seems more like a real person to me than the one by Fra Filippo. 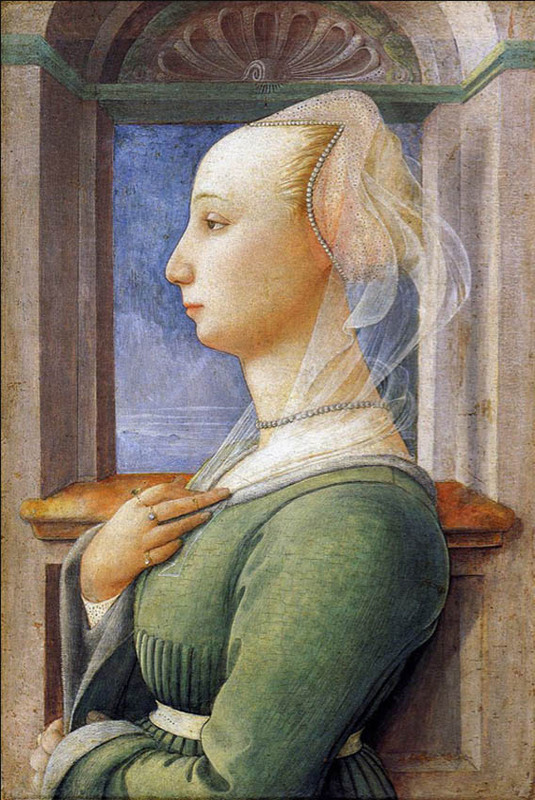 Like the Uccello above, the outline of the head takes precedence over the rendering of volumes within it (I wonder if the paint has been abraded over the years). A great deal of attention has been lavished on the complex patterns of the dress; the contrast with the elaborate dress makes her face seem quite serene. 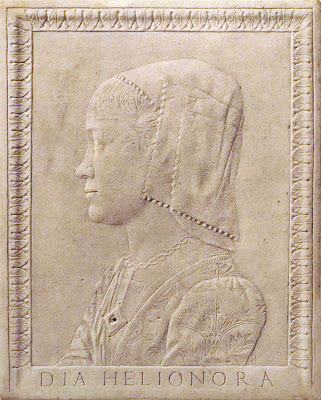 Attributed to Sperandio of Mantua, Eleonora of Aragon, ca. 1475; marble, 11 1/4 x 9 1/4 in. I thought it interesting to compare this low relief with the painted portrait just above. The two women are wearing similar patterned dresses. What is curious to me is how much softer this work in hard marble is: I feel that I can sense the flesh on cheek and chin, and the rounded folds of the sleeves. Eleonora is before us as a real person, lovely, but not idealized. 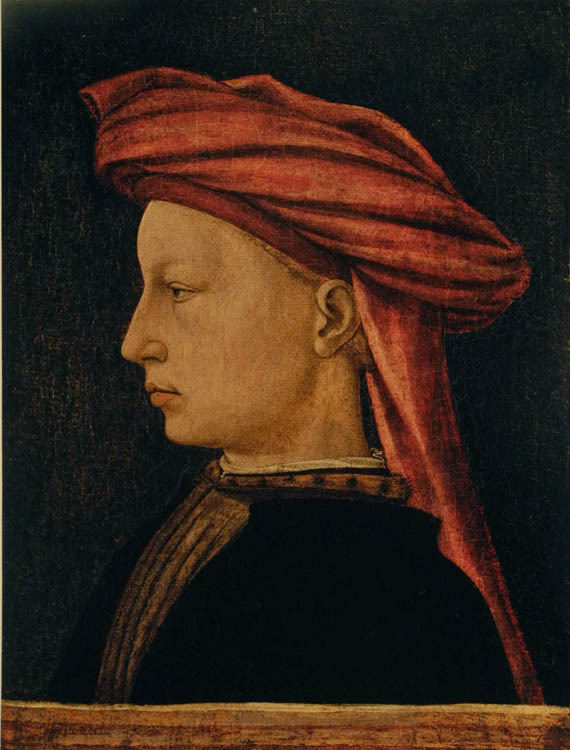 Pisanello, Leonello d'Este, 1444 (? 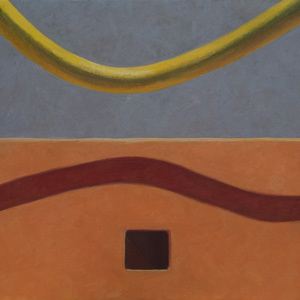 ); tempera on panel, 11 5/8 x 7 5/8 in. I love this painting; it is so personal and quirky. The strange hairdo, the extravagant clothing, the flowers scattered behind the portrait, make it seem almost like a miniature from a medieval manuscript. Florentine Painter, Portrait of a Woman (detail), ca. 1440-50; tempera on wood, 16 1/4 x 12 1/4 in; see the entire painting on the Metropolitan Museum website. The severity of this head intrigued me. This is the only image of a woman in the show which I thought evinced strength and certainty rather than beauty. The set of her mouth, the intense focus of her eye with the extreme curve of eyebrow, even the particularity of her nose combine to make an assertive image (as we might say in Brooklyn: "she's one tough cookie"). The geometry of the head covering enhances this feeling, as does the careful modeling of form. 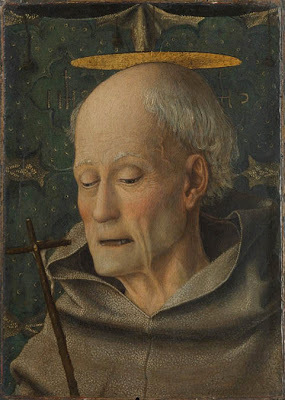 Jacopo Bellini, Saint Bernardino of Siena, ca. 1450-55; tempera and gold on wood, 13 1/2 x 9 3/4 in. This Bellini is a sensitive portrait of age and of faith. An open toothless mouth, loose flesh, shining strands of gray hair are facts of age; they are surrounded by elements of faith: a halo, a simple cross, the clothing of a monk. It is a very moving painting. 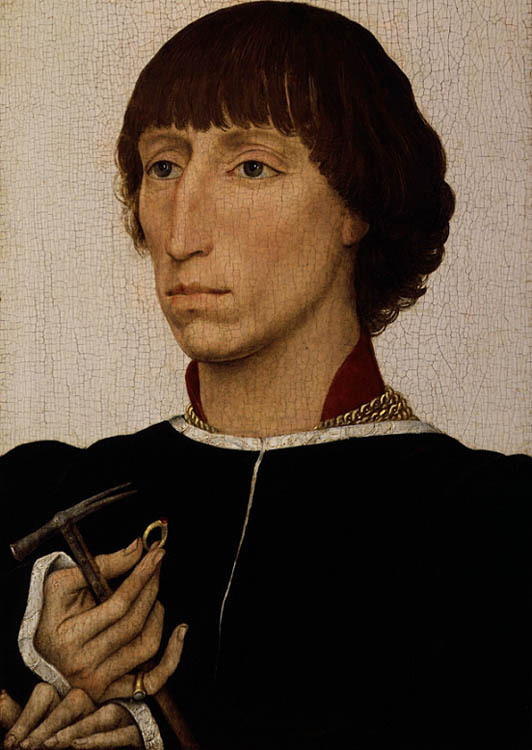 Rogier van der Weyden, Francesco d'Este, ca. 1460; oil on wood, 12 1/2 x 8 3/4 in. 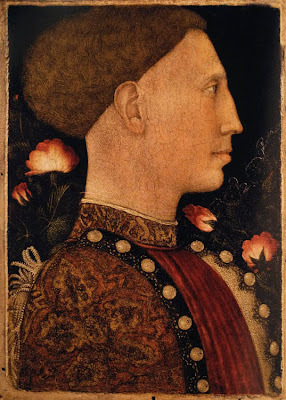 Most of the works in this show were Italian, but there were a few Northern European paintings, including this solemn portrait of the illegitimate son of the ruler of Ferrara. 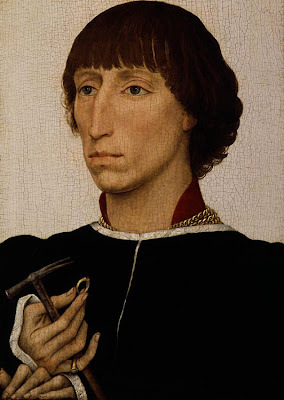 He'd been sent to the Netherlands to be educated, and van der Weyden was an important portrait painter at the time, so it's not surprising that this portrait was commissioned. The long fingered hands hold symbols of power, and rest provocatively on the picture's frame. Mino da Fiesole, Piero di Cosimo de'Medici, 1453-54; marble, H. 21 1/2 in. I sometimes have a hard time with sculpture; its presence as a real object in space makes it seem too real, not transformed enough into art. But some of the portrait sculpture in this show was remarkable, and I couldn't help but feel stunned by its life and energy, this portrait of Piero most of all. The artist managed to make this very powerful man both a specific human being who seems our contemporary, and a symbol of dignified grandeur. Workshop of Antonio Rossellino, Cosimo de'Medici, ca. 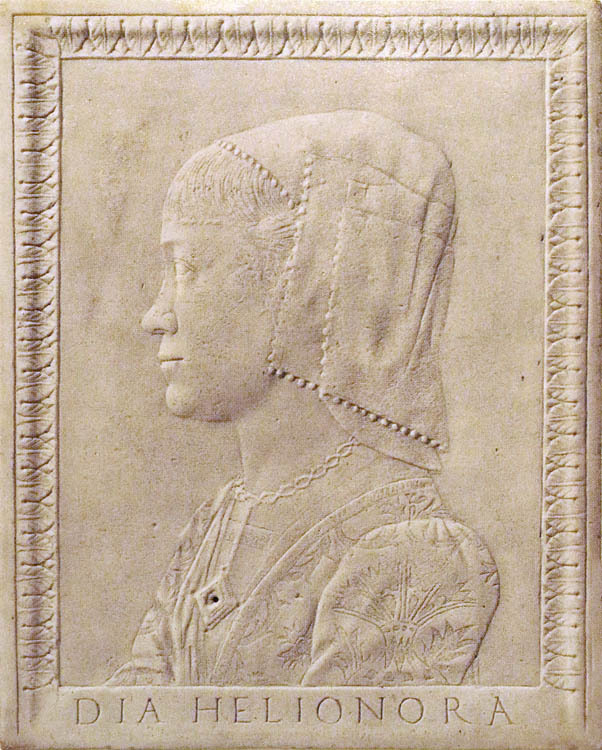 1460; marble. This portrait of Cosimo, the head of the Medici family, is a very different picture of age from the one of Saint Bernadino above. It is an image of determination, from the clear eye to the set of the mouth, and shows a man who is still at the height of his power. 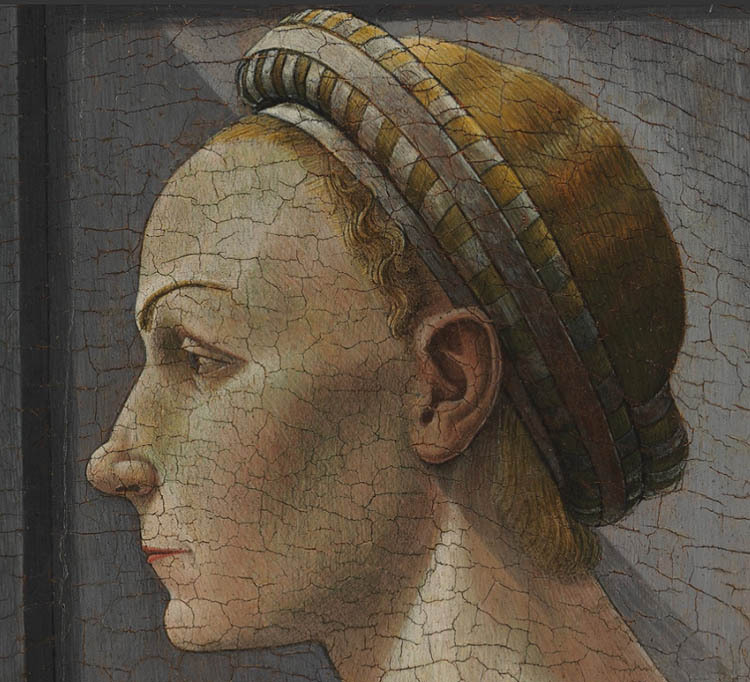 The focus on the individual that these portraits proclaim was a new development in Europe during the 15th century; this exhibit gives us a reason to celebrate that change. I think that portraits are the most difficult things to render. I love reading your thoughts about these portraits. I agree, Lisa, that portraits are very difficult: not only do you want to get a likeness, but also want the painting to have life in it. I'm glad you enjoyed my prose. and I know how important faces are to you, R Henry. While I was writing this, I thought about Chuck Close, whose primary expression is the portrait, and how his work gains so much of its strength from that. rappel, I agree about the gravity. I love this period of painting, and I think the clarity of form, with its precise edges, gives it some of that quality. It would be nice to know what all the little and big signs are pointing to in the paintings. For instance, the Met website said about the portrait of Francesco d'Este that the things he was holding were probably symbols of power, but they couldn't decipher them; why was he holding that hammer? Thanks, Altoon, for this peek at a show that I would love to see, and your verbal reactions. Portraits are indeed an interesting genre. A book on Picasso's portraits first awakened my attention to him only a few years ago, after I had purposely ignored him for decades. You're very welcome, Erik. How interesting that Picasso's portraits are what gave you entry to his work. Thanks for amplifying my experience of one of my favorite periods. Perhaps some of the gravity mimics that of those whose portraits would have been done. A lot of weight seems to have attended those who held power, as it was such a shifting dangerous dance. Julie, thanks for reminding me of the difficult political situation at the time. As rappel mentioned above, there was a lot of sociological material embedded in these portraits, which I certainly don't understand. Altoon, I really enjoyed your review of this show, thank you. One of the things that surprised me was the depth from the sides in the workshop of Rosellino profile marble sculpture of Cosimo de'Medici. When viewed from the side it was almost fully three dimensional instead of sunk into the picture plane, and yet it was also 'compressed'. Could not think how this would have been originally displayed, and I'd never seen anything like this from that period before. Perhaps there was some info. on it in the audio that I missed. 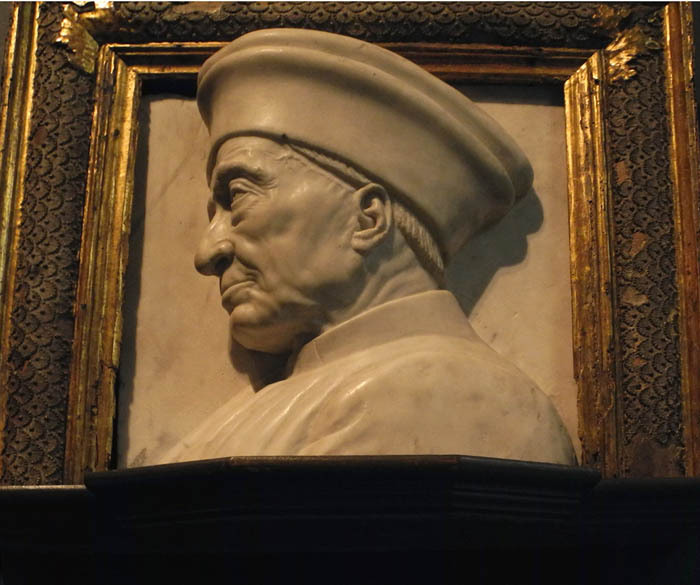 Thank you Mona, and I agree that it was surprising how deep the relief is in the Cosimo portrait. It is such an amazing piece of sculpture.